Hyderbad: Hero MotoCorp, the world’s largest two-wheeler manufacturer, today commenced the construction of its new manufacturing facility in the state of Andhra Pradesh. 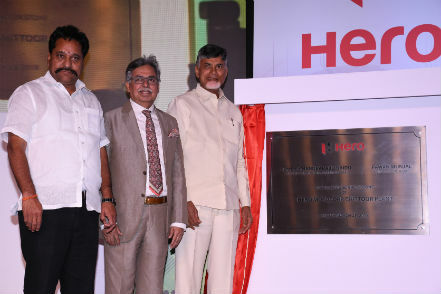 PawanMunjal, Chairman, Managing Director & CEO, Hero MotoCorp, along with the Honorable Chief Minister of Andhra Pradesh Shri N. Chandrababu Naidu laid the foundation stone of the new facility in Sri City during a ceremony. This will be the eighth manufacturing facility of Hero MotoCorp, which already has five world-class plants in India and one each in Colombia and Bangladesh. Spread over 600 acres in the Chittoor district of Andhra Pradesh, the facility will have an annual installed capacity of 1.8 million units, which will be achieved in three phases. The company will invest Rs. 1600 crore in setting up the manufacturing facility. The plant is expected to be operational before December 2019. The new facility will generate 2000 jobs at the Plant and is expected to generate an additional 10,000 employment opportunities, through the creation of a manufacturing eco-system of vendors and suppliers in the region.Given the strategic location of the plant, this can also act as a key hub for the Company to export its range of products from this facility to some of its key overseas markets. 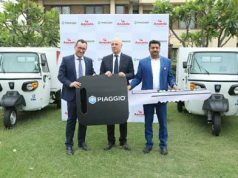 The new plant will be based on Hero MotoCorp’s core principle of sustainable manufacturing, as the company remains committed to maintaining the highest ecological standards. From efficient building envelope, to the Big Foot air handlers, to water and energy optimization – the new plant will demonstrate Hero’s environmental aspirations. The existing manufacturing facilities of Hero MotoCorp in India are located at Haridwar in Uttarakhand, Gurgaon and Dharuhera in Haryana, Neemrana in Rajasthan and Vadodara in Gujarat. 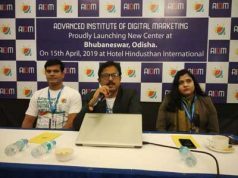 The Company also has two manufacturing facilities at overseas locations – Villa Rica in Colombia and Jessore in Bangladesh – to cater to the growing demand for its products in international markets. The combined installed production capacity of the Company is currently 9.2 million units per annum, which is highest in the country. With the additional capacity of this plant, Hero MotoCorp’s combined annual production capacity will reach 11 million units. 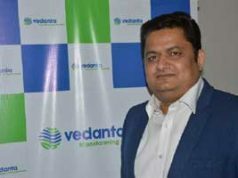 This is in continuation with the Company’s strategic initiative of building world-class infrastructure in order to meet future market demand and consolidate its leadership. With the highest production capacity and highest customer touch-points, over 6500, in the country, Hero MotoCorp is on course to meet the growing demand for its products in the next few years.